The official Bricks'2000 Website has been relocated. Thanks to ALL OF YOU for your incredible support on this game! We have really been overwhelmed by your reactions and the responses we have received. Currently, we are already working on the next version of Bricks'2000 (formerly known as Tetris'99 *) which will even be better than the latest release and offer cool features you might have never seen before! However, until then, it's not possible for me to continue maintaining the "Absolute Bricks'2000 Highscore" and all the other stuff on this page. It simply ate up too much of my time, sorry. However, please visit the Official Bricks'2000 Site which continues updating the Absolute Bricks'2000 Highscore list and also offers other things like a download of the game itself, a guestbook, a Tips section, and other cool stuff will follow. Another way to get the game could be via FTP search. Note: under Win7, there is an error message during setup, but usually the game is installed fine to C:\Brk'2000. You could also try to find the "ideal" download location by doing an FTP search. The latest versions of Brk_2000. * should be listed at the top. (5 of 5 Stars) at SharePaper.com ! (5 of 5 Stars) at MiningCo's Freeware collection ! Here is a Screenshot of Bricks '2000. 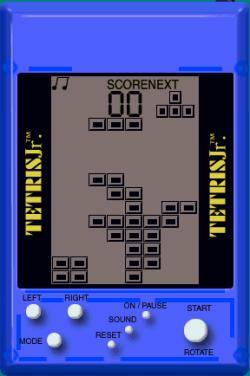 Bricks 2000 is not affiliated in any way with the so-called "Tetris Company". It is an individual product with individual design and very special configuration and add-on features introduced by A. Bikov and R. Fellner. To see its very unique look, please compare how the product by the Copyright holder of the name ("Tetris Jr.PC") looked like in Dec'98. If you play the game you will immediately find that there are even more differences. However, the company mentioned above obviously wants to kill our game and see it removed from the market: if we don't stop developing and offering it, they will send us their lawyers, they threatened us. Please visit the information page with the full story about their unfair business tactics and support us if you want to see more versions of this game! Survey - your opinion counts! We are highly interested in your thoughts and suggestions since keeping in touch with you, the users, who have made this program into what it is today. Please tell us your ideas for features you'd like to see, for improvements which could make using Bricks'2000 into even more fun, about problems/bugs you found or if you simply have questions regarding the current program version.